Why does a Prodigy instrument play like a much more expensive model? 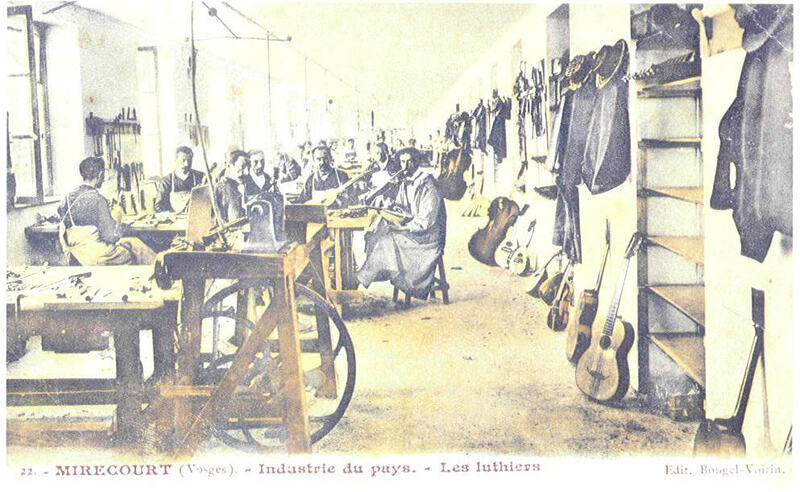 The master craftspeople who oversee every step of the process are called Luthiers. The word “Lute” is the root of this term. 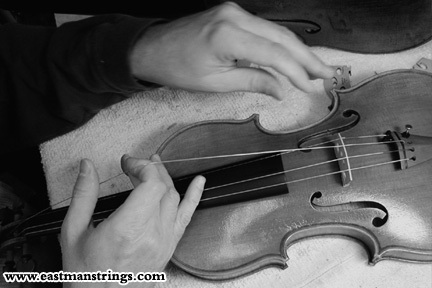 It refers to the maker of any string instrument, whether bowed or plucked. 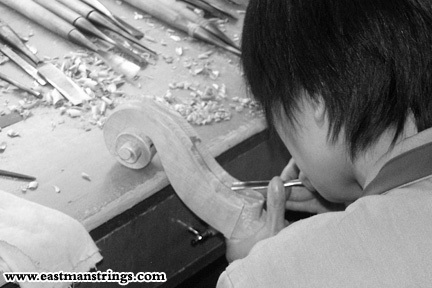 Our Luthiers have made building quality string instruments their vocation, travelling to Europe to study with the masters. Only then do they return to their home country and hand-craft string instruments for Prodigy. 1. The wood is hand selected - aged spruce for the tops and maple for the backs, ribs, necks, and scrolls. 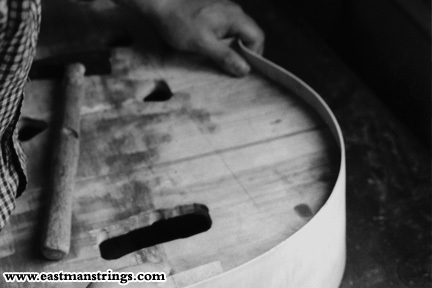 The wood that is chosen for the structure of the instrument will have a great impact on the finished product. One can compare the individual pieces of wood in a Prodigy instrument with the ingredients that go into a gourmet meal. Even the most highly skilled craftspeople in the world could not create a masterpiece without the finest materials. 2. The ribs are shaped in a rib mold. Ribs must be thin but strong. Their curvature imparts structural strength to the body. But nonetheless, they are still the instrument’s most delicate component. 3. Tops and backs are cut from blocks of tonewood. Exterior arching is carefully shaped. Depending on the model, tops and backs are cut from either single pieces of tonewood, or from book-matched pairs joined at the centre. The finely calibrated gradations in thickness, called “graduations” are completed from the inside. 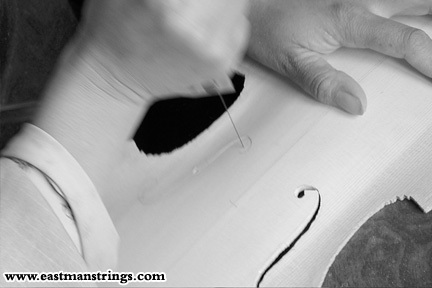 There is no machine that can perform this delicate work with the accuracy of our luthiers. Correct graduations are essential to how the instrument responds. 4. F-Holes are cut in the tops. F-Holes are rough cut with a jeweller’s saw and then finished with a knife. These holes are essential to the release of the instrument’s sound. 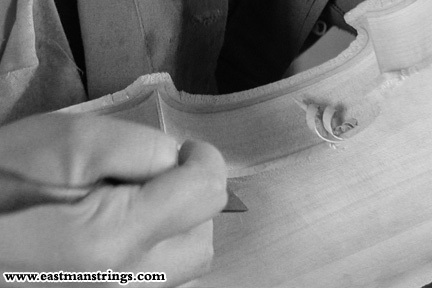 Experts can identify examples from historically significant luthiers partly by the shape of their F-Holes. 5. The bass bar is glued to the inside of the top. The bass bar is a slightly springy piece of wood that provides support and enhances the bass notes of the instrument. It is carved to match perfectly when glued to the interior surface of the top. Then it is shaped for strength and tonal enhancement. 6. The top, back and ribs are glued together. The edges of the top and back are individually shaped to exactly follow the curvature of the ribs. The three layers of purfling are protective as well as decorative. They are meant to prevent any edge cracks from extending to the body of the instrument. 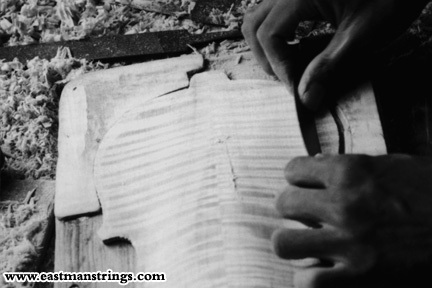 The carving of the purfling channels must be precise to ensure there are no gaps between the thin wood of the purfling and the edge of the channel where it is inlaid. 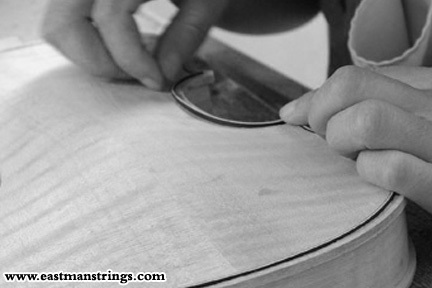 Prodigy luthiers take pride in their ability to cut and inlay the purfling as precisely as possible. 8. The scroll is carved from aged maple. This hand made sculpture is the basis of the instrument’s personality. No two Prodigy scrolls are identical. So the scroll provides the instrument’s signature. 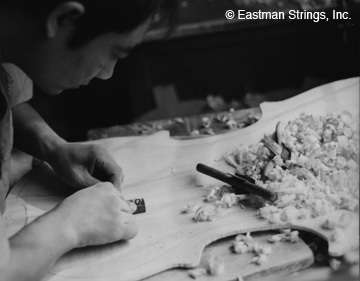 A neck carver takes over once the scroll is complete, properly graduating the neck to make playing easier. 9. The completed neck and scroll are custom fitted to the neck block. The proper angle and a tight fit are essential to a Prodigy instrument’s strength, sound and delightful playability. Edges and corners now receive their final touches. 10. The surface is scraped smooth. A scraper is an unusually shaped blade with a burred scraping edge, rather than a sharp cutting edge. A scraped surface is superior to a sanded one because it avoids the cloudy appearance of wood tat has been sanded. 11. The instrument is varnished for beauty and durability. Brushes of different sizes are used so that large surfaces and fine details can all be carefully detailed. Necks are left unvarnished to provide a smooth shifting surface. Prodigy uses modern fast drying varnish to create a tough surface that resists scratches. This varnish also allows the instrument to resonate better. 12. The instrument is carefully set-up to play beautifully. When the varnish is dry, the pegs and the end button or endpin are fitted by hand using special tools. Only top quality solid wood fittings are used. A custom carved bridge and soundpost are fitted. 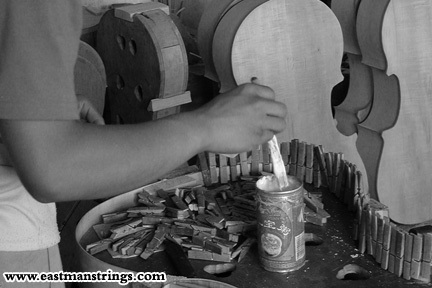 Then the strings are installed and the instrument is ready to play its first note. 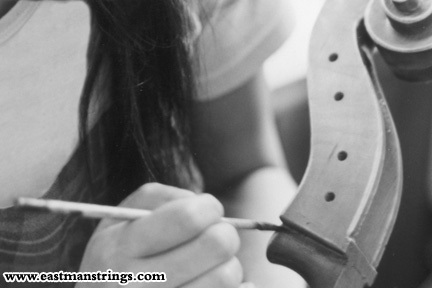 The set-up of your Prodigy string instrument is the final adjustment it receives before being delivered. 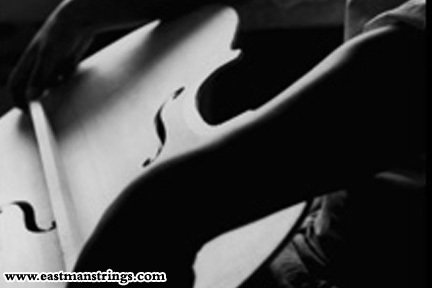 This includes how high the strings are from the fingerboard, exact placement of the bridge and many other fine details that make an instrument play well. There are different ways to set-up an instrument. Musicians are very particular about how their instruments are set-up. Prodigy instruments are set up to MENC standards with a French bridge and sacconi bridge arching. Since Prodigy instruments are specifically intended for student musicians, every aspect of the set-up is intended to help students play well from the first note. Prodigy carefully chooses the wood and material for our instruments to deliver an instrument with a look and sound that is classic, rich, and smooth. Now that you understand how a Prodigy instrument is created, you can see why your Prodigy instrument will have more in common with a traditional European instrument than the typical machine-made European models of today. Prodigy instruments are designed to help musicians progress faster. Since your instrument will be new, you can depend on its reliability for many years. See how your Prodigy instrument compares to an older instrument . 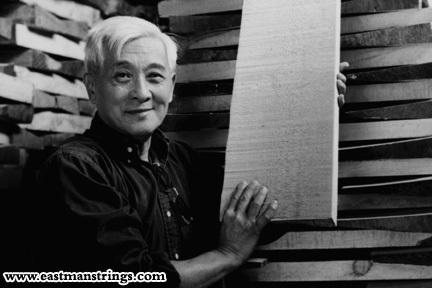 We invite you to delve further into our story, and meet the people who are proud to make Prodigy string instruments .